Tonight’s “After Dark” image was snapped in Tomorrowland at Magic Kingdom Park of the classic Walt Disney’s Carousel of Progress attraction. The attraction has been spinning guests through a 21-minute Audio-Animatronics journey through the history of progress since it opened at the park in 1975. The attraction was originally designed by Walt Disney for the 1964-65 New York World’s Fair and currently highlights the achievements of the day in 1900, 1920, 1940 and beyond. 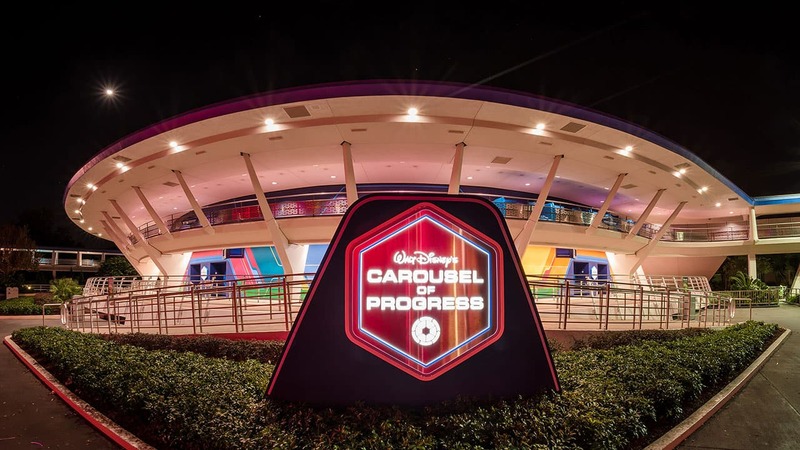 Is Walt Disney’s Carousel of Progress a must-do for you? Tell us in the “Comments” section below. My Dad, also worked on the construction of the General Electric pavilion that housed COP at the 1964-65 World’s fair in New York City, and he always remarked on the “new” technology Walt Disney was creating for the fair. This was always one of our top destination at the fair (with one of the longest wait times!) But it was worth the wait to marvel at the animatronic family that entertained us in inside! I still get that thrill every time I ride COP! I wish there was a tribute to all the attractions that Walt Disney created at the World’s Fair so that others can realize how great the Disney impact was at the fair! Is the new sign a reference to Horizons the sequel attraction? My son just turned 16. He loves the mountain rides and all the thrills but this is his absolute most favorite attraction at WDW!! I love the COP, its a perfect place consider the brilliance of Walt Disney and his showpiece of American progress. I was also at the 1964 Worlds Fair in NY and I sang at it as well. I always ride the Carousel of Progress each time I Visit WDW. I think it is on the list to be updated. Carousel of Progress is my favorite ride in the Kingdom. I first rode it when I was nine at the New York World’s Fair with my Nana and recently took my three year old granddaughter on the ride. She loved it! When it is a hot day and the wife and I are tired from poking around MK and just want to take a rest, this is the place we go. It goes nice and slow as it winds its way around and you can rest your feet and take advantage of any breeze that wafts over car while you are rolling along. It is also a respite from sitting down on the ground on a bench or concrete lip on a curb (if you can find one that is unoccupied) in the hoards of other visitors in the park. We really miss it at Disneyland- wish they would bring it back. When I went to Disney World in 2013 for the 1st time, my 85 year old mother had to see COP each day we were there. It is still magical. In 1964 I was in training in New York City. I was away from my family for 6 months and attended the NY World’s Fair almost every weekend and the COP was my favorite. I was thrilled to see it again (and again) at WDW. To this day it is still my favorite. It reminds of when I started on a new career in the Big Apple. I now am retired within 1 hour of WDW with an annual pass. I really appreciate the many updates to the COP. I fondly recall the COP from the Worlds Fair of 1964 in NYC. It was the first place we ever experienced Disney attractions, The Carousel, “It’s a Small World”, “Great Moments with Lincoln”, “The Ford Skyway” All were huge hits at the Fair. It was a real treat to encounter them again at Disney World and Disneyland. “Now is the time, now is the best time, now is the best time of your life”. This has always been one of my favorite attractions, since the first time I saw it in 1965 at the NY World Fair. I was lucky to be on temporary duty (Fed Gov’t employee) in Brooklyn for 2 months; the fair was just a 15 cent subway ride away, so I went to the fair many weekends. 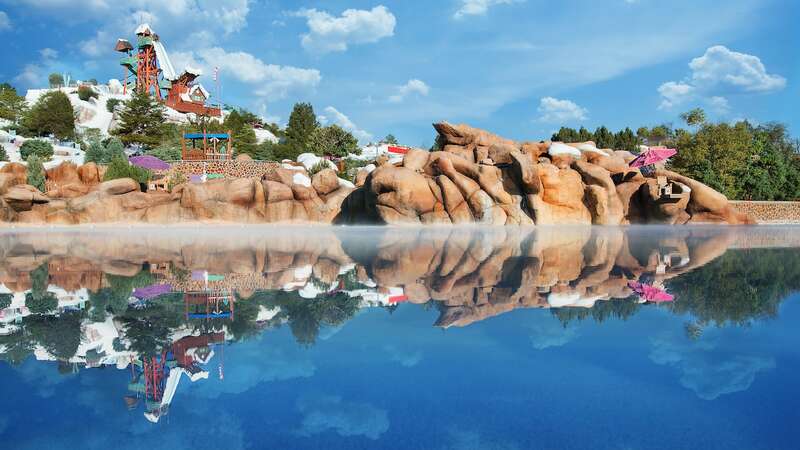 🙂 🙂 I If I had a penny for every time I’ve seen it, I’d be able to bankroll a 14-night vacation at my favorite resort, Caribbean Beach Resort. I have really missed the Carousel of Progress, especially since “Tomorrowland” the movie came out. I live in Arizona and always go to Disneyland. I have been planning to go to WDW in 2021 for the 50th Anniversary Celebration since all of the new lands and rides will be open. I have added COP to my list of must dos. Thanks for this article and all of the Comments. One of the first shows I ever saw. I remember I was 5 and I was in awe of this big building that rotated. I was beyond thrilled to sot through the whole show and to this day still go see it at least a couple times a year for the memories. It is one of my most favorite attractions! We didn’t ride it this past trip because my two year old wouldn’t have sat through it, but we did sing “There’s A Great Big Beautiful Tomorrow” to him! Our family still sings the “Now is the time” , one of the many family traditions at WDW? Yes it is wonderful. We were at Disney during Christmas in 1974 and they did a soft opening. The song then was THIS IS THE BEST TIME OF YOUR LIFE. Years later they used Walts original ITS A GREAT BIG BEAUTIFUL TOMORROW. Look forward to it every visit. The COP is my favorite ride of all time! It really gives me hope for the future through innovation and creativity! I first rode this ride with my parents in the mid 70’s as a child and now with my husband every time we visit WDW since 2003!!!! This ride brings back the best vacation memories with my parents and now the best current making memories with my husband! Thank You WDW for keeping this ride and the peoplemover going on into the future!!!!!!!!! CoP is a sentimental journey, and will always have a special place in my heart. “It’s a great big beautiful tomorrow” always puts a smile on my face. Love the Carousel of Progress!! Omg, of course whenever at Disney, I have to go on the Carousel of Progress, because it is a great big beautiful tomorrow!!!! the carousel of progress is where my heart lives. i LOVE this attraction. thanks for featuring! Singing “Great big beautiful tomorrow”in the Carousel of Progress is a must do of my trips to Walt Disney World. When is this attraction going to get Fastpass+? Every time I go, I always end up waiting in a huge line! This would make my dad, who worked on this for the ’64 Worlds Fair, happy. He was both proud of the work they did on it (the company he worked for was one of the subs doing the interior) and remembered it as the one time he got to meet Walt, who came by while they were building it. The COP is an absolute must-do on all of my trips! I hope Walt Disney World never gets rid of this, as it’s truly one of Walt’s classic attractions! I love watching this show at least 5 or 6 times on every trip & it’s even better at night time…I do miss the old sign though!